The difference between The Walk and Zombies, Run! – Zombies, Run! The difference between The Walk and Zombies, Run! Hello everyone! We’re aware there’s some confusion about how The Walk works for those of you who are avid Zombies, Run! players. The thing is, despite both being awesome fitness apps that vastly improve your life, the two games are actually very different. We designed The Walk to be more of an ‘all-day’ experience than Zombies, Run! 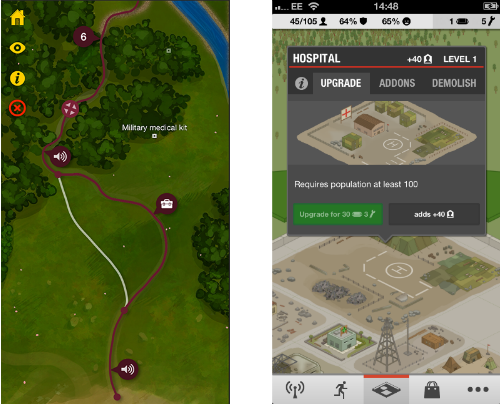 We love that people are ‘going for a walk’ with The Walk in the same way they ‘go for a run’ with Zombies, Run! — but we also wanted the game to work in a broader way. The Walk was designed not just based on the practical advice of scientists and doctors, but also with people’s normal habits in mind. That’s why it behaves as an activity tracker that encourages you to walk an extra five or ten minutes here and there throughout the day rather than making you go on hour-long walks with your headphones in. The iOS version of The Walk even has push notifications that will alert you whenever you’ve unlocked a new story clip, so you don’t need to keep checking the app. Just set it running, forget about it, and check your lock screen to listen to clips in a row at your leisure. 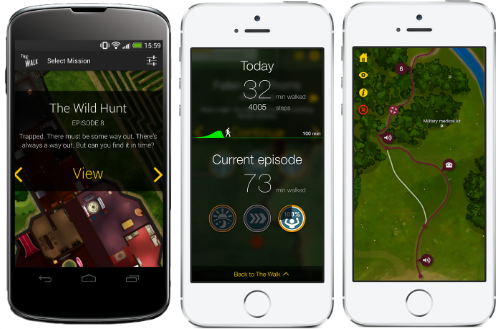 And when you’re ready you can view your rewards, listen to your new story clips, and plan your route. We love long walks as much as the next person, but we know that’s impractical for a lot of people to do every day. Instead, we’re hoping to encourage you to take healthier routes and develop healthier habits — fewer car journeys or public transport and more walking, where possible! Of course, you can still listen to the story as you walk, but as you progress through the story, you may find it easier to unlock a few clips before listening to them. You can do this by, visit the map selection screen and tap on the speech bubble icon, where you can queue up entire episodes to listen to. Zombies, Run! is a great fitness tracker for bursts of exercise, such as jogging, cycling or long walks in the countryside. Whereas The Walk is an excellent way to track your every day activities. There’s absolutely nothing stopping you from running both simultaneously! Previous Post The Walk is OUT NOW! Next Post Happy New Year from Six to Start!